All your favorite songs from one of Ireland's greatest singer songwriters. If you can't find the song you were after try the other sections, the odds are that it's here and it may have been recorded by another artist besides Christy. which will include 11 songs. Some old and some new tracks. I'm sure the Honda 50 song will be included. The name of the new album is Folk Tale. Everything has changed, yet everthing remains the same. what I love to do and that's singing these songs. This working life I have is about songs. It's been a marvlious journey and thankfully it's still continuing. with that feeling and I kind of like it. on the Oil Rigs and stayed long enough to get a decent guitar. play support to them. That opened a lot of doors for me. songs, that was the deal. The first song I ever recorded was Connolly Was There. 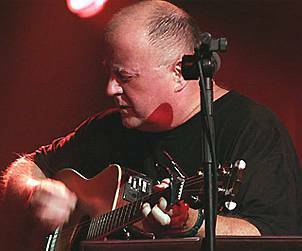 As far as I'm concerned there's no real folk scene in Ireland, as there is in England says Christy Moore as we setteled ourselves comfortable with pints in the sunshine outside a Fleet Street pub. There no interest in a folk scene, I think the basic difference between Ireland and over here is that in Ireland the clubs are run by the publicans to make money. In England they are run by people who want to hear the music. I think that of all the money that goes into the Irish folk scene the preformers get the least of it. For the past two years Christy has been working on the British folk circuit, basing himself in Halifax Yorkshire. Christy comes from a musical family but his first real inspiration as far as folk music is concerned were the Clancy Brothers whome he heard when he was 15. All the best songs I sing I colected myself Christy told me but I also sing a lot of Dominic Behan songs and I'd like to make an l.p. of his songs some day. As far as the colecting is concerned I did not get the songs from anywhere in particular. I know a few songs from the area I came from, Kildare, but that part of the country isn't renouned for singing. I did colect a lot from Tipperary and Clare. Christy has just completed his first record for Mercury Records and with Robin Hall and Jimmy McGragor and songwriter David Campbell, is one of the first folk singers to be singed to the label. Titled ''Paddy On The Road'' , it will be released before the end of the year. Among the songs that Christy has recorded are, Cunla, Curragh Of Kildare, Father McFadden, James Larkin, Avondale and Maid Of Athy. Backing is supplied by Ray Swinfield on flute, guitars Danny Wright and Ike Isaacs and Jack Fallon on bass. Steve Benbow arranged the songs and was the musical director as well as playing the guitar on the sessions. I was really surprised with the l.p. says Christy, I was reluctant at first to use the backing but when I heard the tapes I was pleased and I did enjoy the sessions. It was time for Christy to go then. He finished his pint, bade me farewell and disappeared into the lounch time crowd. Paddy Was Back On The Road. Interview by Tont Wilson For Melody Maker in 1969. The Scariff Martyers / Bridge At Killaloe lyrics chords. Christy On The Clancy Brothers. they were going to be playing in The Gaiety up in Dublin. to the Gaiety and it was the most amazing gig I was ever at in my life. Shortly after the Gaiety I was at a fleadh cheoil in Bunclody.